Agriculture and climate change are closely linked, and soils store vast amounts of carbon. But what happens when carbon sequestration in the fields of smallholders becomes a new focus in climate and agricultural policies? While energy giants like Exxon and Shell have drawn fire for their roles in warming the planet, the corporate meat and dairy industries have largely avoided scrutiny. Land investors, whether private or governmental, are particularly interested in large-scale tracts of land located in the less-developed countries of the Global South. Inevitably, such investments have an economic, social, and environmental impact in the countries concerned. 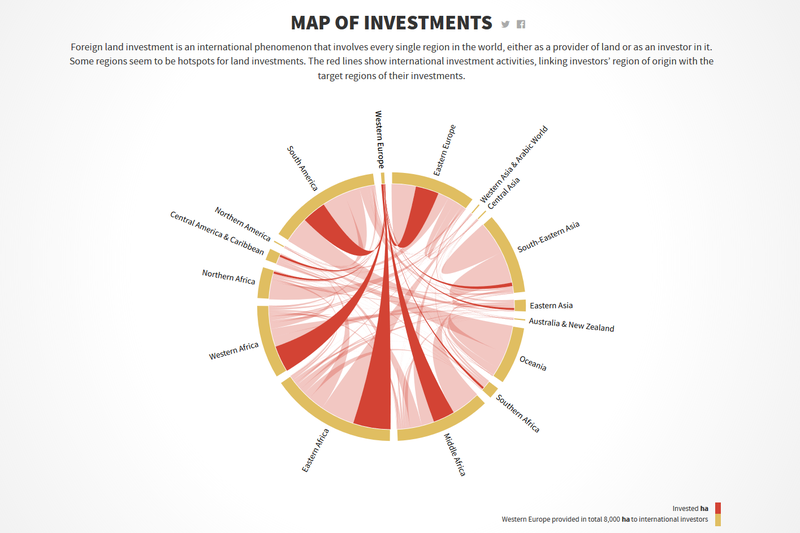 This website landmapping.org demonstrates the link between several development indicators and the prevalence of large-scale land investments. This report is being issued as an alert to governments, civil society organisations and grassroots movements. It points to how gene drives, while promoted as a tool for medicine and conservation, will find their real use in food and farming by agribusiness. The top 20 meat and dairy corporations emit more greenhouse gases (GHGs) than Germany. Business as usual growth of meat and diary production makes the Paris Agreement impossible and climate catastrophe inevitable. Our Fact Sheet shows the data and possible solutions. All graphs of the Agrifood Atlas are published under a Creative Commons License CC BY 4.0. and can be continued to be used, processed and published under the mentioned conditions. You can find all downloads available in various formats (png, pdf) here. We live in a world in which more people have to be be fed with less waste of resources and less environmental damage - how can the agriculture of the future slove this problem?